Congrats to Laura & Jason for getting married last Sunday! I wasn't able to post any pictures for the longest time because my firefox was having problems this week. Oh and sorry for all the bad pictures, there was really bad lighting at the restaurant. The wedding was held at a Chinese restaurant in Chinatown...very typical asian wedding. Lol & the invitations said 5pm...Everyone got there around 7pm. This was the center pieces. Very simple and pretty. This was the gift favors, a custom candle that smelled like vanilla. I think the cherry blossoms were on the cake to. Me and my bf. LOL I look so pasty next to him in this picture. 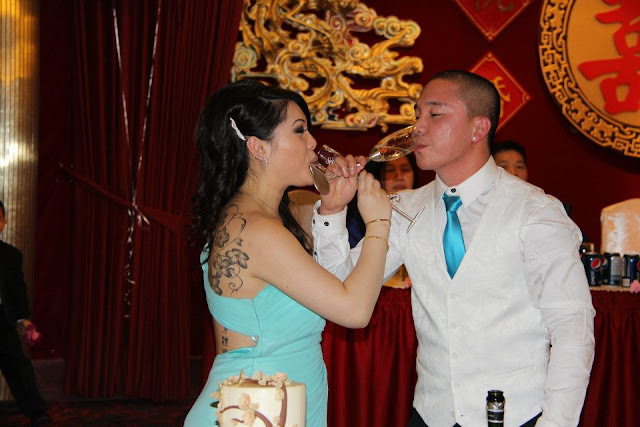 You know this is a Chinese & Vietnamese wedding, when there is a few big bottles of Hennessy on EVERY table. LOL. I wore the maxi dress that I bought on ebay. I took a few more picture & also with the bride & groom but unfortunately not with my own camera. lol so don't go thinking that I'm a loner! Soooo YUMMY with hot sauce. I didn't actually eat this because in high school I watched a documentary about shark fin & it made me promise my self to never eat it again. I wish the lobster came with the crispy noodles. Sun's BBQ on Centerstreet serves their lobster with it & it is AMAZING! OMG! BEST CHICKEN DISH EVER! It was so juicy and tender! & the skin was salt and crispy! Jacob is one of the CUTEST baby alive! I took a stalker picture of him lol. I tried taking a picture of the fish before the waiter ripped it apart...didn't work but it was very tasty. SOOOOO yummy. There was a lot more food that I didn't get a chance to take picture of lol but oh well.